Trump Muddles DACA Program in Anti-immigrant Twitter Comments - Integration Through Media ....! 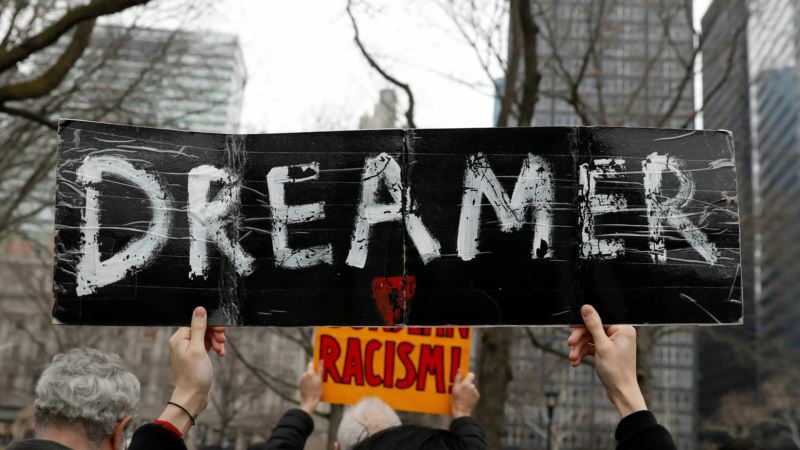 (VOA): While President Donald Trump has said illegal immigrants heading toward the United States are trying to take advantage of an Obama-era policy that shields certain people from deportation, the program known as DACA is actually not open to new entrants. At issue is the Deferred Action for Childhood Arrivals program, which the Republican president last September ordered rescinded. Under DACA, hundreds of thousands of young adults dubbed “Dreamers” who were brought into the United States illegally as children have been shielded from deportation and given work permits. On Sunday, apparently in reference to a caravan of 1,500 Central Americans who are journeying through Mexico toward the United States, Trump wrote on Twitter: “These big flows of people are all trying to take advantage of DACA. They want in on the act!” But there is no “act” to get in on. Newly arriving illegal immigrants cannot win protections under DACA, created in 2012 by Trump's Democratic predecessor Barack Obama, for two reasons. Anyone admitted into the program had to have been living continuously in the United States since June 15, 2007, along with other requirements. In addition, Trump himself ordered an end to the program, and the U.S. Department of Homeland Security is not accepting new applicants. Under Trump’s action, DACA was supposed to have begun winding down last month. But courts have ruled that Trump acted improperly and that the hundreds of thousands of immigrants currently enrolled still qualified for protections while the legal fight over DACA unfolds. When he announced he was ending DACA, Trump urged Congress to come up with a legislative fix. Referring to the Dreamers, Trump said, “I have a great heart for the folks we’re talking about, a great love for them.” Seven months later, DACA participants are living with the uncertainty over whether they will be protected or targeted for deportation. Meanwhile, following a series of failed negotiations with Democrats and some Republicans in Congress, Trump has been fuming over the refusal of lawmakers to fully fund a $25 billion wall he wants to build on the U.S.-Mexican border. The wall became a bargaining chip in DACA replacement legislation. “NO MORE DACA DEAL!,” Trump said on Twitter as he blamed Democrats for the situation. “DACA is dead.” Matthew Wright, a government professor at American University in Washington, called Trump’s tweets “not connected to reality.” Wright noted that Trump rejected several Democratic offers to address DACA, including at one point a deal that would have provided $25 billion for his wall. Last month, Senator Angus King, an independent who caucuses with the Democrats, said Trump’s rejection of that offer was the “high-water mark” for the wall’s prospects in Congress, where support for it is tepid at best.